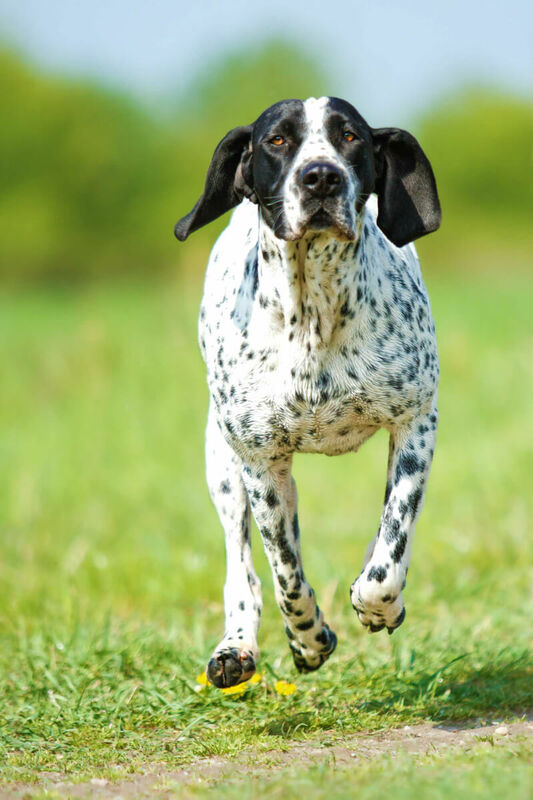 The Braque D'Auvergne ("brahk doh-vern"), also called the Auvergne Pointer or Blue D'Auvergne, is a French hunting dog known for its lively work ethic and its undying devotion to its owners. Bred to hunt and track small game, this medium-sized breed is very task-oriented and obedient, and is very affectionate with kids and other animals. Whether accompanying its master on a hunt, curled up next to the fire, or playing with the kids in the yard, a Braque is incredibly personable, and will make a great addition to any family. Because of their high energy levels, these dogs are best suited for homes with yards, which will give them plenty of room to explore. Below are the details and specs for the Braque D'Auvergne dog breed. A medium-sized breed, Braque D'Auvergnes weigh 49-62 pounds; males stand 22 ½ - 24 ½ inches at the shoulders, while females are 21-23 inches in height. Extremely people-friendly, lively, obedient, and intelligent, this breed is a hard-working hunting dog that makes a fantastic family companion. Braques are excellent tracking dogs, and are very affectionate with children, other animals, and even strangers, but may suffer separation anxiety if left alone. Braque D'Auvergnes are a fairly low-maintenance breed. The most frequent requirement for these animals is their constant need of company. Their short coats require little in the way of grooming; as active hunting dogs, they will need plenty of exercise; and they are very easily trained. Breeds of this type have existed in the Auvergne and Cantal regions of Central and Southern France for centuries. During the 18th and 19th centuries, French peasants crossbred numerous types of pointing dogs (known as "braques"), including the Gascony Pointer and the Pyrenean Braque. 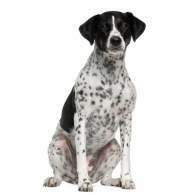 Out of this selective breeding came a black and white pointer known as the Braque D'Auvergne (or, because its black and white markings appeared almost blue in color, the Braque Bleu D'Auvergne). According to popular legend, this breed was brought to France by soldiers returning from the Siege of Malta around 1800; this legend has been ultimately disproved due to contradictory evidence, but some French citizens still claim it as the truth. In 1913, the official Réunion des Amateurs du Braque d'Auvergne (RABA) club was formed in France; later that year, the breed was formally recognized by the Société Central Canine, the official French kennel club. In the 1940s, when World War II ravaged France, the Braque D'Auvergne became almost extinct, but the RABA club rebuilt their number in the following decades. Today, these dogs exist in other parts of the world, though rarely; a majority of Braques still remain in France. Braque D'Auvergnes are generally equal in height and length. Its head is large and oval-shaped, and its ears are long, rectangular, and hang from the skull. Most Braques have long, jowl-like upper lips. Eyes are large, oval, and hazel in color. The breed's chest is deep, its legs are long, and its body is relatively narrow, all designed to give it great endurance in the field. The tail is long, carried horizontally, and is often docked to half its length. This breed is white with black mottling, and it has black spots; this combination of markings may give the dog a bluish appearance. The head and ears are almost always black with white accents. This breed is medium-sized. Males are 22 ½-24 ½ inches high at the shoulders; females, 21-23 inches. Weight for both sexes ranges from 49-62 pounds. *Height is measured in inches from the front paws to the top of the shoulder while the dog is standing on all four legs. Braque D'Auvergnes are obedient, intelligent, gentle dogs that are highly trainable. Bred to be natural hunters, Braques instinctively develop close, subservient relationships with their handlers; the breed is extremely people-oriented, and will make an excellent addition to the family. The downside to this personality trait is that Braques get lonely easily, and will thus require almost constant company. Also, this breed is wholly ineffective as a guard dog, because a Braque will likely welcome intruders rather than show aggression to them – and may even try to follow them home. But these dogs can be trained to perform many tasks, and do very well in obedience trials. 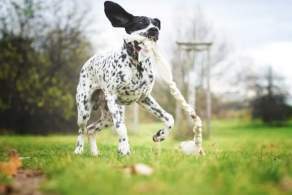 While A Braque's athletic ability is only average, its desire to please combined with its hunting instincts (which include an excellent sense of smell) make it an outstanding hunting and tracking companion. This breed is especially fond of children of any age, and will return any affection it receives. As with all dogs, it is important to socialize and train them at a young age. Overall, Braque D'Auvergnes do well with other animals. They socialize with other dogs easily; because of a moderately high prey drive, they may chase smaller pets, including cats. As a natural people-pleaser, this breed treats strangers with affection. While it may be slightly wary of unknown people at first, it will soon warm up to them, and be glad to have another new friend. Below are pictures and images of the Braque d'Auvergne. Braques are short-haired, and shed only moderately, so they will require brushing only once every 1-2 weeks. 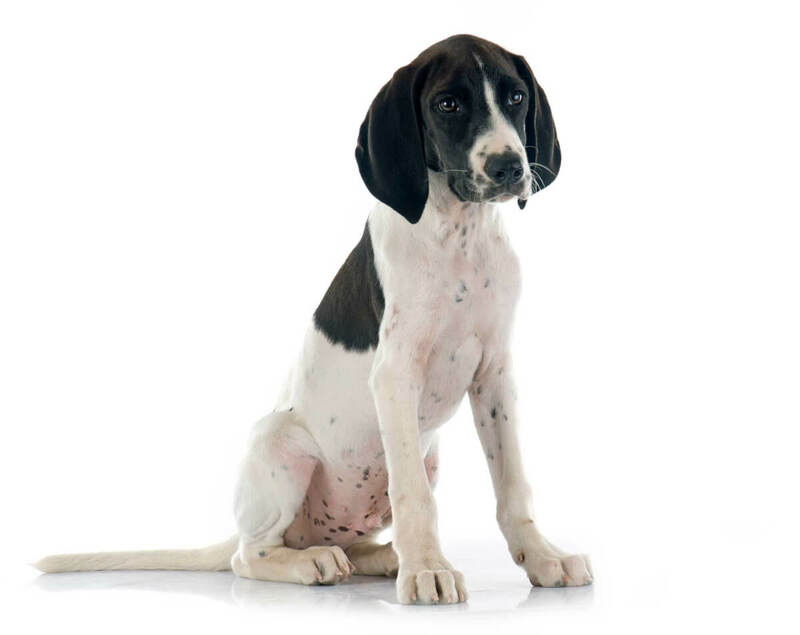 Occasional baths are needed, with special attention paid to the Braque's large, droopy ears, which may collect dust and debris. As natural working animals, Braque D'Auvergnes require a good bit of exercise. 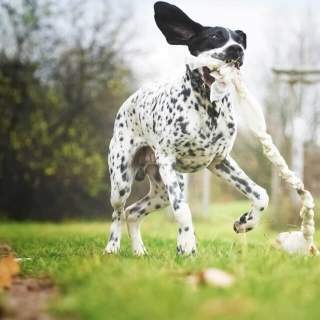 An hour-long daily walk or run is recommended; these dogs also love outdoor activities like tag and chase. Braques are in their natural element, though, when tracking game through the woods. Due to their lively natures, these dogs are best suited for homes with yards that allow them to run and explore. Apartment living may cause a Braque to feel too confined, especially if left alone. As natural outdoor dogs, Braques can tolerate any type of weather. This is a very robust breed; minor health issues, while rare, may include hip dysplasia (a malformation of the hip socket) and bloating of the stomach.